0021 Concept of Function | Out of the Math Box! Hints will display for most wrong answers; explanations for most right answers. You can attempt a question multiple times; it will only be scored correct if you get it right the first time. In which table below is y a function of x? If x=3, y can have two different values, so it's not a function. If x=1, y can have different values, so it's not a function. Each value of x always corresponds to the same value of y. Topic: Understand the definition of function and various representations of functions (e.g., input/output machines, tables, graphs, mapping diagrams, formulas) (Objective 0021). Which of the graphs below represent functions? There are vertical lines that go through 2 points in IV . Even though III is not continuous, it's still a function (assuming that vertical lines between the "steps" do not go through 2 points). Learn about the vertical line test. I, II, and IV only. There are vertical lines that go through 2 points in II. Understand the definition of function and various representations of functions (e.g., input/output machines, tables, graphs, mapping diagrams, formulas). (Objective 0021). Which of the following equations could also represent A for the values shown? For a question like this, you don't have to find the equation yourself, you can just try plugging the function machine inputs into the equation, and see if any values come out wrong. With this equation n= -1 would output 3, not 0 as the machine does. For a question like this, you don't have to find the equation yourself, you can just try plugging the function machine inputs into the equation, and see if any values come out wrong. With this equation n= 2 would output 4, not 6 as the machine does. Simply plug in each of the four function machine input values, and see that the equation produces the correct output, e.g. A(2)=6, A(-1)=0, etc. For a question like this, you don't have to find the equation yourself, you can just try plugging the function machine inputs into the equation, and see if any values come out wrong. With this equation n= 2 would output 8, not 6 as the machine does. Topics: Understand various representations of functions, and translate among different representations of functional relationships (Objective 0021). The pattern below consists of a row of black squares surrounded by white squares. How many white squares would surround a row of 157 black squares? Try your procedure on a smaller number that you can count to see where you made a mistake. Are there ever an odd number of white squares? One way to see this is that there are 6 tiles on the left and right ends, and the rest of the white tiles are twice the number of black tiles (there are many other ways to look at it too). Topic: Recognize and extend patterns using a variety of representations (e.g., verbal, numeric, pictorial, algebraic) (Objective 0021). The "houses" below are made of toothpicks and gum drops. How many toothpicks are there in a row of 53 houses? Can the number of toothpicks be even? One way to see this is that every new "house" adds 4 toothpicks to the leftmost vertical toothpick -- so the total number is 1 plus 4 times the number of "houses." There are many other ways to look at the problem too. Try your strategy with a smaller number of "houses" so you can count and find your mistake. Remember that the "houses" overlap some walls. Topic: Recognize and extend patterns using a variety of representations (e.g., verbal, numeric, pictorial, algebraic). (Objective 0021). Which of the following does not represent the number of gumdrops in a row of h houses? Think of this as start with 2 gumdrops on the left wall, and then add 3 gumdrops for each house. Think of this as start with one house, and then add 3 gumdrops for each of the other h-1 houses. Look at the gumdrops in 3 rows: h gumdrops for the "rooftops," h+1 for the tops of the vertical walls, and h+1 for the floors. This one is not a correct equation (which makes it the correct answer!). Compare to choice A. One of them has to be wrong, as they differ by 3. Topic: Translate among different representations (e.g., tables, graphs, algebraic expressions, verbal descriptions) of functional relationships (Objective 0021). Each number in the table above represents a value W that is determined by the values of x and y. For example, when x=3 and y=1, W=5. What is the value of W when x=9 and y=14? 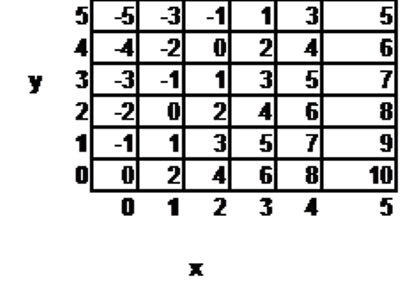 Assume that the patterns in the table continue as shown. When y is even, W is even. Note that when x increases by 1, W increases by 2, and when y increases by 1, W decreases by 1. At x=y=0, W=0, so at x=9, y=14, W has increased by \(9 \times 2\) and decreased by 14, or W=18-14=4. Try fixing x or y at 0, and start by finding W for x=0 y=14 or x=9, y=0. George left home at 10:00 and drove to work on a crooked path. He was stopped in traffic at 10:30 and 10:45. He drove 30 miles total. Just because he ended up 30 miles from home doesn't mean he drove 30 miles total. George drove to work. On the way to work there is a little hill and a big hill. He slowed down for them. He made it to work at 11:15. The graph is not a picture of the roads. George left home at 10:15. He drove 10 miles, then realized he‘d forgotten something at home. He turned back and got what he‘d forgotten. Then he drove in a straight line, at many different speeds, until he got to work around 11:15. 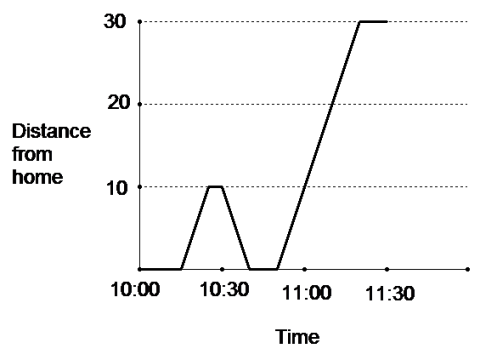 A straight line on a distance versus time graph means constant speed. George left home at 10:15. He drove 10 miles, then realized he‘d forgotten something at home. He turned back and got what he‘d forgotten. Then he drove at a constant speed until he got to work around 11:15. Topic: Use qualitative graphs to represent functional relationships in the real world (Objective 0021). The function d(x) gives the result when 12 is divided by x. Which of the following is a graph of d(x)? d(x) is 12 divided by x, not x divided by 12. When x=2, what should d(x) be?